Three years ago, on a cool summer Friday night, I stood in the garage, tinkering under the hood of a BMW while my roommates threw a bit of a house party. Just me and a few friends, polishing up parts to escape the blaring music and obnoxious college drunks. Amidst the chit chat, over what exactly I fail to remember, two young guys walked up, eager to see what we were up to. "We saw the party and figured it was okay to walk up." Of course it was - I had just moved in and was a decent way away from my own stomping grounds, so I welcomed the opportunity to connect with some new local car guys. Their names? Cory Hutchison and Rodney Nichols, and they were, and still are, one of the most humorous, quirky, and genuine pair of best friends I've ever come across. We stood around for some time - chatting about my builds, and of course, theirs too: Hondas. Preludes made their gears tick just as BMWs made mine. But I knew that would change. As the evening wound down, I invited the two over the following weekend, mentioning that it'd be great to wrench on one of the cars; however, I left them with some parting words: "Mark my words... if you hang around here long enough, I'll have you guys in BMWs before you know it." It shouldn't surprise anyone reading this that Rodney and Cory have become two of the closest friends I've ever had; even less surprising should be the fact that they're both driving BMWs. Well, almost. Rodney sold his E23 735i in hopes of finding something a bit more suited to his needs. However, that brings us to his Mercedes 190E - while it's no BMW, it's quite outstanding, and European, which is close enough for a "victory" in my book. However, winding back, Rodney has been a Honda fan for as long as he's been in to cars - but his fanaticism isn't limited to things with four wheels. His passion for street bikes runs just as deep, and for the first few years I knew him, a Honda CBR sat between his 2nd-gen Prelude and his fiancée's 5th-gen Prelude. "I think I'd have to sell the car before I'd sell the bike," he's told me before. Like any motorcycle fan, he'll tell you that there's something special about being on two wheels. However, to the shock of our friend circle, Rodney eventually put the bike up for sale on craigslist. Whether it was for another bike, money for a car, or to pay bills, I don't recall. But it happened. Cheap motorcycles bring out all walks of life from Craigslist. Lowballs and trade requests came pouring in - the kinds of people that offer less than half of the asking price or a trade for two tickets to a concert that happened last week. One call, however, piqued his interest - a trade request for a gray market Mercedes Benz 190e. It hardly ran, the paint was faded, and it had some older-model, big-body Benz's front end fiberglassed into place. Rodney wanted to take a look, and I couldn't have been more excited. Later that week, Rodney showed up at my house in a red 190e. The front end hung out over the bumper like a pug with an overbite, and the paint was reminiscent of a Coke can left outside for years; the lustrous red faded into a cloudy pink. It sputtered as it idled and it hardly wanted to accelerate - the obscure diaphragm-utilizing injection system was on its way out, and for Chevrolet technician, it was all Chinese to Rodney. But he was excited. Hidden behind the milky paint was an original Zender bodykit in seemingly perfect shape, mounted to a car that was, aside from its paint, in excellent condition, dent and ding free. Inside, hidden behind torn fabric was a set of original Recaros, mounted next to the euro-only dogleg manual transmission. A rare optioned D&W wheel and shift knob have been in place since new, and cloth houndstooth doorcards covered up manual roll-up windows. The car had it "all" - everything the Benz guys dream of snagging, and it had simply fallen into Rodney's lap. However, it was a long road to bring the car back to it's proper shine. If he wasn't a paint-buffing wizard before, he his now. Rodney has spent (and still spends) a lot of time buffing and polishing the old paint to keep it glossy. The paint quickly fades to its washed-out state without constant attention - but Rodney works hard on preventing it. After sourcing the original european-spec headlights from across the pond, he found a hood in great condition from a local junkyard. Rodney and Cory stripped it down and re-sprayed it in the back of a woodworking shop, and miraculously, the match is spot-on. The car began to look a bit like Mercedes had initially intended. After the bodywork and paint were straightened out, Rodney focused on figuring out the engine issues, ordering numerous parts from ebay in the name of a proper-running car. After the issues were sorted, the Benz was put on daily duty, driving Rodney on his one-hour-each-way commute to and from the Chevy dealership. After much deliberation, Rodney decided on wheels: a set of 17x8 and 17x9 splits that hark to the Aeros of the "AMG Hammer." Wrapped in 205/40 and 215/40 Falken 512s, the Krones fill the oddly-square arches of the 190e perfectly. To get the car sitting right, Rodney created a custom set of strut mounts, paired with custom springs and struts for a quality ride with proper style. After finalizing a few tidbits, the car was finally ready for show season, and to say it turned heads is an understatement. 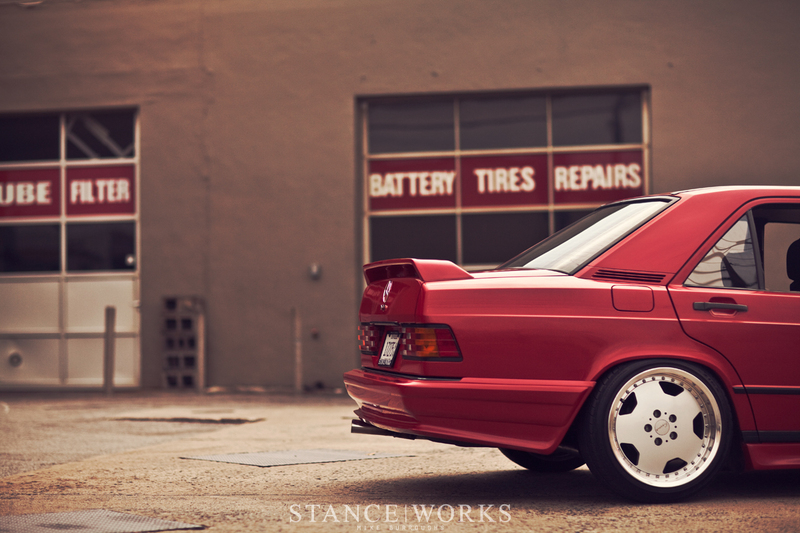 Rodney has since taken the once hardly-running Benz all over the East coast, from SoWo to H2Oi. He's been stacking serious miles on it while his once pride-and-joy Prelude sits waiting to be re-assembled after a paint job from almost a year ago. The wheels have been sold off, and it's fate? Only he knows for sure. While I know Rodney's Honda days are far from over, he insists there's still much to do on the Mercedes as well - plans for a driveline swap top the list. But what stands as best of all is seeing one of the most stubborn people I've ever met (that's you, Rodney, but you know I love you, man) take a leap of faith and branch out into the unfamiliar. Never did he think he'd be behind the wheel of an iconic '80s German sports sedan when we met... but needless to say, I can't help but wait in anticipation to help turn a wrench on the next leg of the build. I’m sorry but that’s not true. ”WÜ” definitely exists as a license plate and is standing for the german district (around) ”Würzburg/Wuerzburg” located in northern Bavaria. Absolutely beautiful car. Enjoyed the article as well. Keep it up! That’s right, WÜ stands for the City Würzburg in Bavaria. The dot on the plate is called “TÜV-Plakette” and only for the rear license plate, but the colour of this changes yearly. Until the year 2010 exists an additional dot for the front plate in form of an hexagon called “AU-Plakette”. What name or code this paint ? Thanks For sharing informational article.. I have a c300 and I am looking for a site that sells mercedes benz brand parts? I am looking for brakes and rotors finally I found one site. The best quality parts are from your nearest Mercedes-Benz dealer, of course. If you want to save some money, http://MBZPARTS.com is by FAR the best for OEM parts — that is, parts made by the same manufacturer who makes it for Daimler. That said, are you looking for some kind of “upgrade”, or if you do honestly need new parts, get here. They cost much less than the dealer part and are better. @MrBobyara let me know if you need the code i have the same car same colour, ill find the code. Dogleg transmissions are found in the 190e 16v Cosworth – so not really “euro-only”. 512 almandine metallic red paint? What type of chassi is it? What is the name of those rims? great 190.. i am working to put AMG on mine.. next i’ll put in here if finished..
Nice car! What is the name of the wheels? 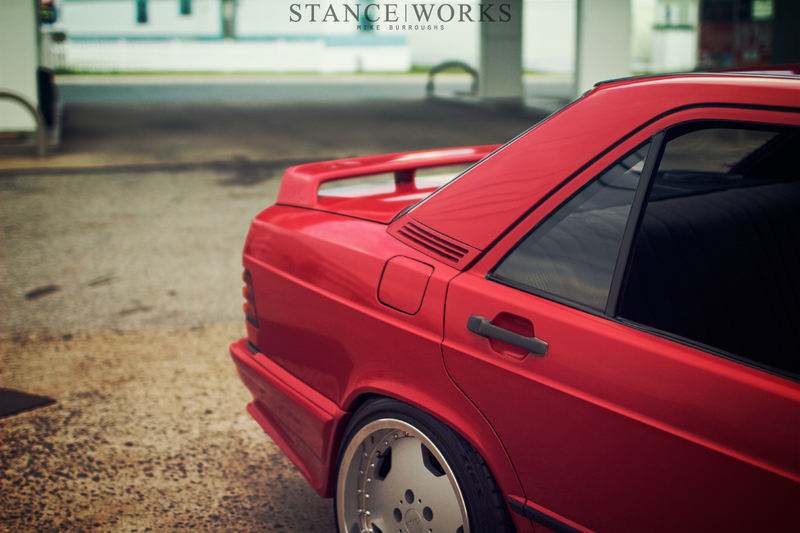 dear stanceworks could you say how much money spending for tuning …..wants to make this shape….wants to learn….buy same model my cars engine is stopped suddenly…no understand anything..360000 km gone …ı know that mercedes gives 1 million km goes ….guranteed …..
What Bodykit did he use ?